Ever felt frustrated trying to find pet-friendly accommodation? Fed up reading "No Pets Allowed"? Yep, we hear you. Going on holiday is expensive enough without having to put the dog or cat into kennels, and let's face it they're part of your family so it's nicer to have them with you. But despair not. Search hard enough and you'll find places that love pets too and will welcome you with open paws. 2 Relax-a-Lodge, Kerikeri: excellent self-contained unit nestled within an orchard, just five mins from Kerikeri township. Includes swimming pool to beat the summer heat. Don't miss the wonderful resident kune kune pigs who will happily take care of your food scraps. 3 Mangawhai Heads riverside holiday park: campground in tranquil setting by the river that flows into the dramatic surf beach at Mangawhai Heads. Pets by prior negotiation. 4 Westhaven motel, Mount Manganui : you'll be guaranteed a friendly welcome here from the owners and Clay, their gorgeous Black labrador. Well appointed, reasonably priced rooms superbly located at the base of iconic Mount Manganui. 5 The Boat House, Whangamata: comfortable bach next to the marina and close to the beach. Has everything you'd need inc two bedrooms for a reasonable rate. 6 Kent Homestay, Raglan: charming bach close to town with great views down to Raglan marina. Good base for exploring the awesome surf beaches, and the many dog-friendly trails in the vicinty. 7 Goose Bay campground: 15km south of Kaikoura. Choice of cabins, tents and powered sites. This is where Rio's ability to sniff out fish very nearly landed him in trouble with a seal. 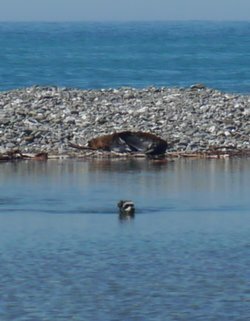 He swam 50m out to a shingle bar oblivious to the lurking danger, turning back only at the very last moment! - hover and view the evidence! . 8 Waitaki Waters campground, Oamaru: modern, clean campground situated next to the majestic Waitaki river. Bags of room for your pet to charge around and burn off excess energy. Pets by prior arrangement. 9 Mossburn Country Park: this beautiful campground enjoys a stunning Southland setting and makes a great base for trips to Te Anau and beyond. We were lucky enough to see the Southern Lights on one balmy Summers evening, a real treat. Ensure your pet is always under control as the park also contains goats, sheep, and alpacas. 10 Beach Road holiday park, Invercargill: campground boasting spectacular sunsets, providing an ideal base for you and your four-legged friends to explore the city and the incredible Catlins. Another good place to look is the website Pets Can Come Too. Needless to say the warm welcome we received is partly due to us behaving as responsible dog owners, keeping the dog under control at all times, picking up, and respecting others. So what are you waiting for...grab yourself some travel essentials for your dog and hit that road!" Happy travels.